As you may or may not know, I was born and raised Mormon. I come from a large, very faithful Mormon family. We do not see eye to eye on a great many things, but we love each other nevertheless. Heck, some of them even still like me (and hopefully still will after this post). Since the moment the religion even became a thought, Mormons have been persecuted. They have been ridiculed, misunderstood, physically and mentally abused by those who view them as "different" and see different as inherently bad. Does anyone else see a similarity to another group of folk here? Since the beginning of time, those in the LGBTQIA (lesbian, gay, bisexual, transgender, queer, intersex, and asexual) community have been ridiculed, misunderstood, physically and mentally abused by those who view them as "different" and see different as inherently bad. I cannot, then, wrap my brain around why the majority of the Mormon community (there are outliers in every group, thankfully, a couple even in my own devout family) cannot see it fit to embrace, support, commiserate with, and protect those who have more similarities to them than differences. Each group knows how it feels to be hurt by those who fear them for what they do not know about them. Each group has had to hide (some by migrating west, some by closeting themselves) to avoid treachery, bigotry, and heinous treatment even to the tune of murder. 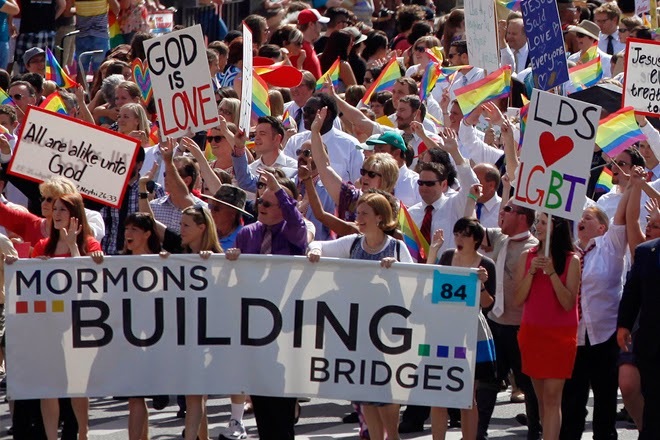 Does the Mormon religion see no connection between what was and is still done to them and what was and is still done to those who are LGBTQIA? Does the Mormon religion see no hypocrisy in persecuting (yes, the efforts they have put into fighting gay marriage propositions and the fact that one is not allowed to "live gay" in their church IS persecution) when they have been persecuted themslves? Is that because they feel justified and right in persecuting others, so they're absolved of fault and guilt? Guess what, my Mormon brothers and sisters, those who have long persecuted you and our ancestors have felt the same way. Think on that. If you, my Mormon kin, can honestly tell me that your persecution is justified, somehow better than that which has been foisted upon you all these great many years, then carry on in your self-righteousness and chosen blindness. I cannot, though, imagine how you can.